Cardiovascular disease remains the number one killer of men and women in the United States. Your heart is like a house, it has electricity and plumbing. There can be problems with the electricity – i.e. irregular heart rhythms, blocked conduction and/or problems with the plumbing i.e. –pipes clogged, valves leaking. Today we are focusing on the plumbing – especially blocked pipes, also known as Coronary artery disease. 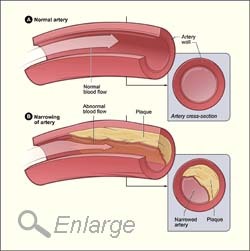 Coronary artery disease (CAD), also called coronary heart disease, is a condition in which plaque builds up inside the coronary arteries. These arteries supply your heart muscle with oxygen-rich blood. How does Plaque cause problems? Plaque narrows the arteries and reduces blood flow to your heart muscle. It also makes it more likely that blood clots will form in your arteries. Blood clots can partially or completely block blood flow. When your coronary arteries are narrowed or blocked, oxygen-rich blood can't reach your heart muscle. This can cause angina or a heart attack. Angina is chest pain or discomfort that occurs when not enough oxygen-rich blood is flowing to an area of your heart muscle. Angina may feel like pressure or squeezing in your chest. The pain also may occur in your shoulders, arms, neck, jaw, or back. A heart attack occurs when blood flow to an area of your heart muscle is completely blocked. This prevents oxygen-rich blood from reaching that area of heart muscle and causes it to die. Without quick treatment, a heart attack can lead to serious problems and even death. Over time, CAD can weaken the heart muscle and lead to heart failure and irregular heart beat (arrhythmias). Heart failure is a condition in which your heart can't pump enough blood throughout your body. Arrhythmias are problems with the speed or rhythm of your heartbeat. CAD is the most common type of heart disease. It's the leading cause of death in the United States for both men and women. Lifestyle changes with diet and exercise are the best course of action. While medicines, and/or medical procedures can effectively treat CAD in most people, prevention is simpler, less expensive and less burdensome. So, what can you do to lower the risk of heart disease or CAD? There are risk factors that we can't change such as genetics, gender, and age. But we can change others such as nutrition, exercise, smoking, obesity, high blood pressure and high cholesterol – Yes these all affect your heart!! The day to day management of your heart health requires conscious nutrition and activity and attention to the risk factors listed below. Research shows that a plant based diet is one of the healthiest for heart health. A plant based diet is one where you do not eat dairy, meat, or poultry. This diet has been shown to not only prevent, but reverse the damaging effects of plaque buildup that causes blockages in the arteries. Another approach is to reduce the carbohydrate and caloric intake found in food plans such as Weight Watchers' or American Diabetic Association. Difficulty usually occurs when unfamiliar foods are introduced. Whether your comfort foods are Meatloaf, Fajitas or Tandoori Chicken, the American Heart Association has a healthier version of it. http://www.heart.org/HEARTORG/HealthyLiving/HealthyEating/Recipes. Smoking injures blood vessels and speeds up the hardening of the arteries which greatly increases a person's risk for heart disease and stroke. The first step to quitting is to possess the desire. As there are many methods to aid in smoking cessation, it is best to discuss with you medical provider which plan is best for you. For support in quitting, including free quit coaching, a free quit plan, free educational materials, and referrals to local resources, call 1-800-QUIT-NOW (1-800-784-8669). - to find out what is in the food you eat. High blood pressure weakens and damages the walls of veins and arteries that can lead to heart attack and stroke. The guidelines for BP management have changed over the years with assessing for one's overall health. Generally, the Systolic blood pressure (top number) should be 120-140. The Diastolic blood pressure (bottom number) should be less than or equal to 85. Your medical provider will give you the appropriate range based on your overall health. Lowering sodium in your diet, exercise and weight management helps to maintain BP within optimal range. Your cholesterol should be measured at least annually. With this and some other health information, such as your gender, age, & smoking status, your risk of heart disease can be calculated by your medical provider. Lowering cholesterol can be achieved through nutrition and activity. By now you may have noticed a common theme of nutrition and exercise – as keys to reducing the risk of heart disease. As we noted last month …. Commitment results in consistency and consistency will produce change.